Ghana is a beautiful country, often affectionately called 'Africa for Beginners' because of its friendly locals and the fact that it is a comparatively stable and prosperous country, ideal for first-time travellers in Africa. This does not mean, however, that travel in Ghana is always without complication, particularly as the tourist infrastructure is only well developed in certain popular areas. Visitors tend to spend their time in the capital city, Accra, the historic royal stronghold of Kumasi, traditional home of the Ashanti people, and in various picturesque coastal villages. 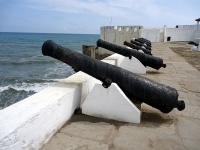 One of the best ways to enjoy Ghana is to explore the coastline, which boasts both incredible tropical beaches and a number of historic colonial forts, many of which are UNESCO-listed. 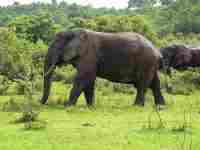 There are two alluring National Parks in the country, where visitors can seek out Ghana's wealth of wildlife: Kakum National Park is a rainforest reserve with some amazing canopy walkways suspended above the forest; and Mole National Park is a massive wildlife reserve, consisting mainly of savanna, and containing more than 90 mammal species. Visitors should note that in the rainy season, between April and October, many roads in Ghana become so muddy and flooded that they are impossible to traverse, making some attractions, like the national parks, very difficult to access.